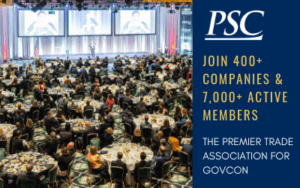 Now is the time to join PSC, the premier trade association for government contractors that provide professional services to the federal government. Join more than 400 member companies and 7,000 active members for exclusive meetings with government customers, business intelligence, networking opportunities and more. Join now to go to the PSC Annual Conference April 28-30 – exclusively for members.